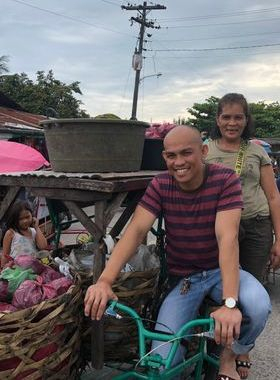 Hernane Jr. drives his mother Leonida to the market. 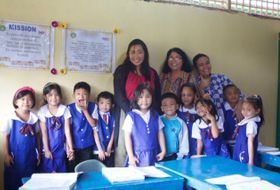 Mayuko at the local private school (GSR Learning Centre) with Teacher Ruby and Teacher Paz . Mayuko with the Denagiba family. This summer, I was gifted the opportunity to volunteer for two weeks under the guidance of the Philippine Self-Help Foundation. This would be the first time I travelled abroad to a country other than the United States and Japan, the first time I visited a place I had never been to nor knew much about, and on top of that, couldn’t speak the language. A summer of so many firsts and new encounters, it has been the most exciting summer I have ever had. Although the two weeks flew by so quickly, I was able to see much of the Philippines, starting in Cebu and going to Bacolod, Cauayan, Bayawan, Bohol and coming back full circle to Cebu. For my two weeks with the PSHF, I was assigned the job of interviewing loan applicants, with the help of the PSHF staff, and writing proposals for those individuals. At the main office in Bacolod, Richard gave me an introduction in the work of the PSHF, as well as a brief introduction on the accounting, and the processes for giving loans. On my first full day in Bacolod, I accompanied Richard and Bernie for a day of field work, and for an interview with Leonida Del Rosario. Although I was just taking notes, it was my first time observing an interview with the PSHF and my first full day going out to meet new people; overall I was a bit nervous. However, I soon came to realize the generosity and kindness within the hearts of everyone there. While we were waiting to interview Leonida, we waited in front of a Sari-Sari store where the owner saw us and offered snacks. 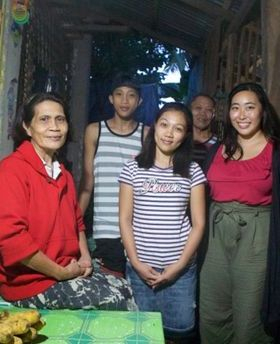 During the interview, Leonida’s daughter-in-law Irene graciously adjusted the one electric fan to face us, rather than herself and her infant son. It wasn’t just in Bacolod, but everywhere I went after this, and over the course of several interviews, people would go the extra mile and provide the utmost hospitality, always being welcoming and more than generous with what they had at their home, even though they might not have had much for themselves. Regardless of the fact that I had just met them for the first time, everyone greeted me with a warm smile and treated me like family. In addition to doing interviews and writing proposals, I also had the chance to visit the Lighthouse Learning Center in both Bohol and Cebu. I spent the days assisting the teachers and spending time with the children. The children were so cute and lovable and I had so much fun teaching them how to make origami and reading books to them. I believe that fostering a child’s love of reading from a young age is extremely important, so it was so wonderful to see books that I myself had often read as a child on their bookshelves. Being able to go to the Philippines was such an amazing experience, giving me a whole new meaning to the saying that “everything happens for a reason.” I came across the PSHF through a series of events that I can only think of as meant to be, all starting from my snap decision to pursue four years of university in Japan, resulting in my need to find a part-time job. I found a teaching job in an English school near my house and I have been working here for the past two years. Around May of 2018, the head teacher of the English school graciously spoke to Richard about my interests in international volunteer work, and gave me information about the PSHF as well as the contact information. Luckily, I didn’t have anything planned yet for that period of the summer so I emailed Richard and suddenly, I found myself booking a ticket to the Philippines. The PSHF taught me so much, but most importantly, it taught me what it means to have and live a life of purpose, helping others to the best of one’s ability and what it feels to be able to making an impact on people’s lives. Every moment from this trip has been unforgettable, and something I will cherish for years to come. What I won’t forget the most from these two weeks are the kindness and hospitality of the people. It didn’t matter where I travelled, each place had the warm feel of what I could call home. Thank you again to everyone in the PSHF, Richard, the PSHF staff, and an extra big thank you to Bernie, Ireen and Winelin for graciously interpreting and translating every interview and being wonderful guides and mentors. I hope to see everyone again soon.